Impact Art Gallery is a proud partner of Artsy: a platform for collecting and discovering art with a mission to expand the art market to support more artists and art in the world. Artsy features the world’s leading galleries, museum collections, foundations, artist estates, art fairs, and benefit auctions, all in one place. They have a growing database of 1,000,000 works of art, architecture, and design by 100,000 artists that spans historical, modern, and contemporary works, and includes the largest online database of contemporary art. Artsy is used by art lovers, museum-goers, patrons, collectors, students, and educators to discover, learn about, and collect art. To view our gallery on Artsy, click here. Impact Art Gallery is pleased to offer Art Money: a new way to buy art. Art Money makes owning art both easy and affordable. Payments are spread over 10 monthly installments. After paying a minimum 10% deposit, you can take your artwork home and pay the remaining balance over 9 months, interest free. 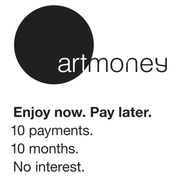 With Art Money an artwork that costs $5,000 is only $500 a month over 10 payments (your first payment is your deposit). Art Money helps you enjoy art, support local artists and galleries, while contributing to the long-term sustainability of local art and culture on a global scale. To view our gallery on Art Money, click here.